Published: Jan. 21, 2013 at 11:42 a.m. Updated: Jan. 23, 2013 at 01:35 p.m. 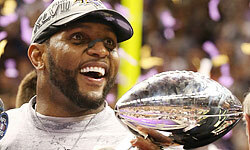 The Baltimore Ravens and San Francisco 49ers have traveled an arduous path to Super Bowl XLVII. The Ravens, who are chasing the second Super Bowl title in franchise history, battled through a spate of defensive injuries while the offense forged an explosive identity under new coordinator Jim Caldwell. Eventually, Baltimore emerged as the AFC's premier team. The 49ers will be making their sixth Super Bowl appearance after dealing with the growing pains of a second-year quarterback who was thrust into action in the middle of the season. Switching from Alex Smith to Colin Kaepernick could have ruined the team's chemistry and offensive continuity down the stretch, but to their credit, the Niners' locker room didn't seem to be adversely affected. Kaepernick, meanwhile, has made them nearly unstoppable. Joe Flacco continues to play like an all-star. The oft-criticized fifth-year pro has been sensational this postseason, compiling a passer rating of 114.7 and completing 54.8 percent of his passes with eight touchdowns and zero interceptions. Most impressively, Flacco has averaged 9.2 yards per attempt, showing the full array of skills from the pocket. Part of Flacco's success has certainly stemmed from Caldwell's superb ability to craft a plan that accentuates the quarterback's strengths as a deep-ball passer. The Ravens have used the entire route tree to create big-play opportunities, from tossing sideline bombs to Torrey Smith on go-routes to going to Anquan Boldin and Dennis Pitta on a variety of square-ins and shallow crossers. The clever utilization of the no-huddle offense, meanwhile, has simplified the game for Flacco while producing a better rhythm and tempo. Consequently, the Ravens have blown through the playoffs behind an offense that is far more explosive and diverse than the regular-season version. Flacco will need to be at his best to move the ball against a talented 49ers defense that throttles opponents with its collective speed, quickness and physicality. Flacco must pepper San Francisco with a variety of short and intermediate passes before taking a few vertical shots to Smith on the outside against Tarell Brown or Chris Culliver. If Flacco can maintain his poise and patience within the pocket, he could make enough plays to deliver the Lombardi Trophy to Baltimore. The offense can befuddle the Ravens with a combination of the zone-read and the vertical play-action passing game from the pistol formation. Kaepernick has executed the clever package masterfully since his insertion as the starter in Week 11, scaring opponents to death with his running abilities while also displaying pinpoint passing skills from the pocket. As a result, defenses have been unable to get a bead on the 49ers' offense, making the unit far more explosive and productive in the postseason. Increased utilization of the zone-read has obviously been a major factor in San Francisco's success since Kaepernick took over. The concept puts the onus on the quarterback to read a designated defender along the front seven, then decide whether to give the ball to the running back or keep it and take off. The 49ers have implemented the concept -- which Kaepernick ran to perfection during his time at Nevada -- to make the second-year playmaker comfortable and add diversity to their power-running attack. This has enabled San Francisco to pummel opponents with a slew of runs between the tackles, complemented by an occasional outside run by Kaepernick, to exploit overaggressive defenders. When operated in rhythm, the combination can produce the kinds of big plays that break open close games. The 49ers have also featured a series of play-action passes from the pistol formation to take advantage of one-on-one coverage on the perimeter. Michael Crabtree, Randy Moss and Vernon Davis have shown they can defeat such coverage, and the hard play-action fakes off zone-read plays have created big-gain opportunities down the field. Crabtree, Moss and Davis have consistently been able to run free through the secondary for gains of 20 yards or more. The 49ers will utilize a combination of zone-read running and play-action passing against a Ravens defense that struggled to contain a similar offensive attack run by Robert Griffin III and the Washington Redskins in Week 14. With two weeks to copy some of the concepts that worked for the Redskins in that game, the 49ers should put together a plan that's chock full of zone-read runs and passes that can keep the Ravens in a state of confusion. If Kaepernick can simply execute without hesitation, the 49ers' new-aged offense could help Jim Harbaugh secure the franchise's sixth Super Bowl title.